noon at gates of cemetery. 3pm for march to the Republican Plot, St. Colman's Cemetery. Holy Saturday, wreath-laying ceremonies at Ballymacnab and Keady. Holy Saturday, wreath-laying ceremony, Republican Plot in Camlough. Easter Sunday, wreath-laying ceremonies at Kilmurry McMahon and Doonbeg. O'Carolan and Kilmartin and hunger striker Kevin Lynch. Holy Saturday, Doneyloup, Castlefin 7.30pm. Clady Bridge, 11.30am. Drumboe Easter Sunday, assemble Johnson's Corner 2.30pm. Easter Sunday, commemoration at Deansgrange Cemetery, 1pm. Easter Sunday, Arney, at the grave of Phiolip Cassidy, 2.30pm. Good Friday, wreath-laying ceremony at the Workhouse, Tuam, 5pm. Galway City, Easter Sunday, 11am. Easter Sunday commemoration and function. Details from SAOIRSE sellers. Easter Sunday, Cahersiveen, assemble 2.30pm at the Monument, The Square. Killarney, wreath-laying ceremony at Republican Monument. assemble at graveyard gates, 12 noon. Easter Monday, wreaths will be laid throughout the county. Holy Saturday, wreath-laying ceremony, Rathciaran, Mooncoin, 12.45pm. Easter Monday, Republican Plot, Mount St Lawrence Cemetery, 3pm. Easter Monday, see SAOIRSE sellers for details or phone 0044-7926357676. Sean Connolly and Tommy Kelliher, 3pm. 2.30pm for wreath-laying ceremony at the Republican Plot. the main commemoration. The main speaker of the day will be Mary Ward. their lives for Irish freedom. of Vol. Seamus McElwaine, 2pm. Easter Message and the laying of the wreath at Joe Styne's grave. After breakfast 'the Countdown to Easter 2016' program will commence. and to the other executed Leaders of the 1916 Easter Rising. Easter Sunday, wreath-laying ceremonies throughout the county. Ballinlough, Easter Sunday, 12 noon, parade to IRA memorial. Elphin parade to County Roscommon Memorial after 11.30 mass. graves of Patrick Seery and Paddy Geraghty. 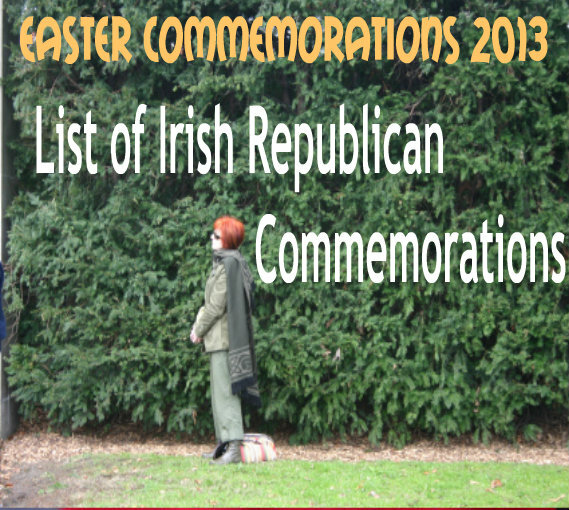 Republican Graves and Monuments over the Easter period. Church of the Immaculate Conception, Rowe Street, 11.15am. Wreath-laying ceremony at the Billy Byrne Monument at 12 noon. Monday. Main speaker Francie Mackey. Clashduv road, Togher for march to St. Finbarr's cemetery, Wilton. fifty years ago, eirigi has said. marking for some the start of the 'troubles' in the North. to be answered," the party said. west Belfast and had not caused any adverse reaction from any quarter. "Who, if anyone, had made the complaints about the banner's presence? Did a Stormont minister issue instructions for the banner's removal? 1964, is back in place on the Falls Road." Easter Lily in the Dublin parliament. the Easter Lily in the Dail reflected is own "deep-rooted prejudices". [Speaker] to make a "ruling" on the matter. prejudices and his loathing of all things Republican. make such ludicrous statements," he said. presented in court as "evidence". leaders attending June's G8 summit. in Ireland's occupied Six Counties. fortified New Barnsley police barracks in west Belfast two weeks ago. a printed note stating: "MK1 10KG Mortar, Range 300 Metres." hotel hosting G8 summit in June. News Barnsley PSNI station Belfast. "Oglaigh Na hEireann (ONH) Belfast." intelligence and private security contractors. over the luxury hotel site. most heavily fortified police bases in Europe. Taoiseach, Enda Kenny, in Downing Street earlier this month. the Clogh Road in Rosslea in the early hours of Wednesday. continued on Thursday before being declared "an elabourate hoax". and nearby nationalist homes on Easter Monday. Street are limited to 30 people. Boys to parade along the disputed route with only minor restrictions. leadership of the UVF can stand outside it?" the commission's decisions was a source of frustration. at this spot outside the church?" she said. by a Protestant supremacist organisation was unwanted. assemble and go to Derry? time again for generations that their sectarianism is not welcome? granted by the Parades Commission then it will be continually sought." year, according to new figures. 2011/12, the most ever paid by the British state to Irish 'touts'. "Who is watching what way the public money is used?," he queried. speaking to MI5 agents following a roadside incident. as MI5 agents and stated that they wanted him to work for them. intimidatory methods to try and exert pressure on vulnerable people. "Do not suffer in silence." arms' plot which could have seen him behind bars for a decade. intelligence agents offering to provide weapons to the men. to inhuman and degrading conditions. he was released last Thursday. the republican wing by former Real IRA comrades. Omagh bomb are set to again appeal the verdict, it has been confirmed. succeeded in overturning his conviction on appeal in 2005. 2009 judgement, but failed to have it overturned. has been reserved after three weeks of evidence. he was before his first trial. juryless courtroom, heard final submissions in his retrial this week. getaway car, Mr Pownall said it proved nothing. conviction may now be impossible to achieve. civil liberties. From the Pensive Quill. explanation was given for this decision. and disturbing to appear to date. prisoners are bound to resist to the better end. serious anomalies within the criminal justice system. the political parties to any questions. are awaking from their slumber.